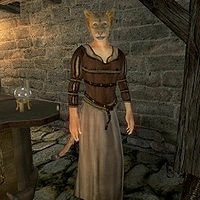 Abhuki is a Khajiit innkeeper at Faregyl Inn. She sleeps on the mat behind the bar from 2am to 6am and spends the rest of the day serving the inn's customers and offering her services as a merchant and as an advanced trainer in Alteration. Being an innkeeper, she can rent you a bed for 10 gold per night. She will also sell and buy food and drinks, though she makes tough bargains because of her high Mercantile skill. She wears common, middle-class clothing consisting of a brown shirt and light brown linens with pigskin shoes. She carries a medium amount of gold. A number of food items and drinks can be found in Faregyl Inn, but there is nothing of actual value. As an advanced trainer, Abhuki can provide you with the necessary reference for the Alteration master training quest. Once your Alteration skill level reaches 70, speak to her, and choose the "training" option, which will trigger the quest. When asked about training she will tell you, "Tooth-in-the-Sea can teach you more than I. Search for him north of Bravil, along the coast of Niben Bay. Or perhaps in it, depending on his mood." If you ask her again about this, she will respond, "Seek out Tooth-in-the-Sea. He can train you further." When you inquire about renting beds at her inn, she will respond, "A bed you seek? There is one here for you, if you have the 10 gold to rent it." If you tell her you'll take it, but you don't have the 10 gold, she will tell you, "You do not have the money for me, so I do not have a room for you." If you do have the money, she will say, "Up the stairs you must go, to the first door on your right. That is your room for the night." If you ask her about renting a bed once you've already rented one, she will say, "You have rented the only room I have for you." Alteration Training: Prove to an Argonian master you are worthy of further training. Interestingly, Abhuki is assigned ownership over many doors and beds in most, if not all, of the inns across Cyrodiil. This was perhaps done to stop other NPCs from using those beds and doors. Abhuki has the first name alphabetically of any NPC, so the programmers may have just used her out of convenience. Esta página foi modificada pela última vez à(s) 04h59min de 5 de fevereiro de 2015.